2017 has been the year of social quilting. I'm feeling more confident in my art so I have expanded a bit out of my comfort zone this year and joined an online bee, am participating in a couple of swaps, am sewing up a storm with my various quilt alongs, and now, I am crossing something new off my bucket list: I'm submitting my first piece in a contest. Every time I go to a quilt show, like I did this weekend, I see displays for contests and I think, "How do people hear about these things? I want to play!" I haven't completely answered that question, but by chance, I did hear about the Cricut Mini Quilt contest and had enough time to enter a submission. Cricut is a cutting matching similar to the Silhouette Cameo I use. I have the original Cameo, bought in 2013. At the time, I went with Cameo because it was the only option for creating your own designs. 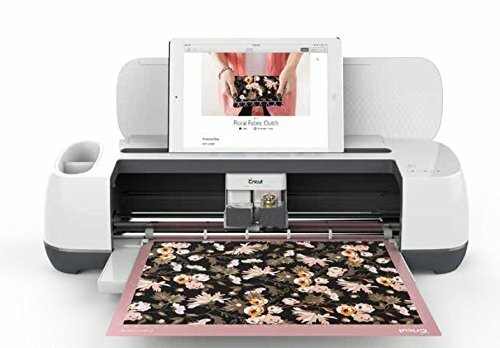 I've started thinking about upgrading to the Silhouette Cameo 3, but now since learning about this contest, I'm impressed with the Cricut Maker, which looks pretty great, too. Cricuts have come a long way in the last few years! Three lucky winners of the mini-quilt contest will win one of these beasts. There was a very short window for making the mini-quilt. 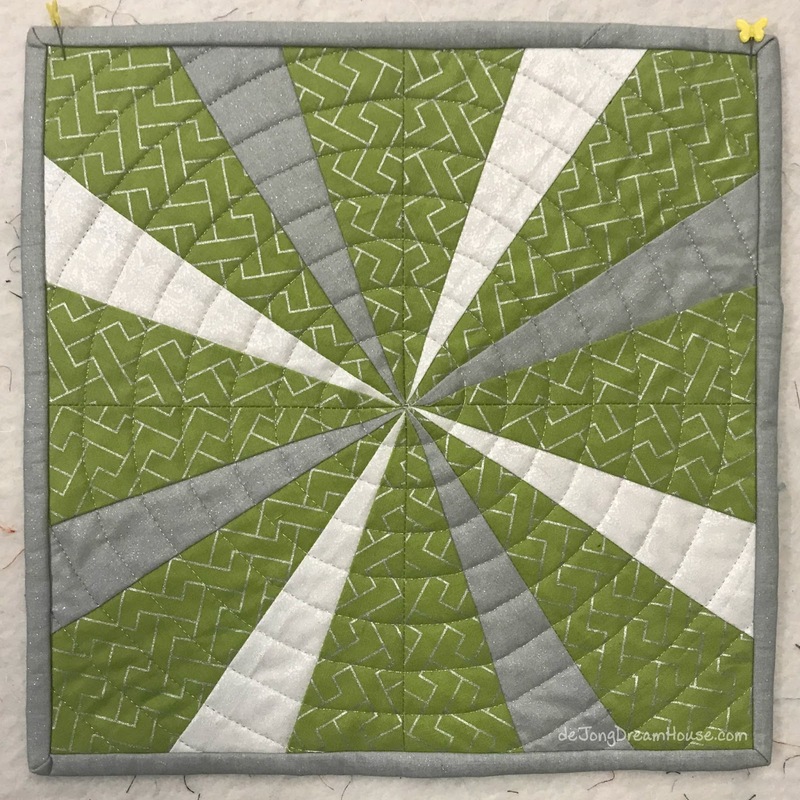 The quilt can be any design, as long as it uses any combination of green, gray/silver, and white fabric and measures 12" x 12." I decided to paper piece a block using a smaller version of the pattern I created for my Fireworks for Ingrid quilt. I took extra care to make sure my points matched up. When I had all four sections done, I played around with the layout. I chose the middle one because I thought it had the best "wow factor" to stick out from the other submissions--fingers crossed! I am pretty pleased with my points. The middle got pretty thick with two points intersecting, but I was able to push down the seams quite a bit so the block lays flat. I had so many kind compliments on the spiral quilting on Ingrid's quilt, I decided to do the same thing with my mini. I used silver metallic thread. I've been scared to use it in the past, but I loved the way it looked with the prints I chose. I don't have a stitch regulator on my Pfaff Quilt Expression 4.2--my only complaint!--so I quilted slowly to keep my stitches even. The hardest part is the beginning when the spiral is so tight and the initial semi-circle unfurls. I have been quilting for 4.5 years and am working on my 90th quilt. Every single time I've bought a quilt, I did it all by machine. I know that hand quilted binding is preferred at shows, but it's always been too overwhelming for me to try. After attaching the binding--by machine--I sat and stared at it awhile. On one hand, the mini size makes it a good option to try something new. On the other hand, since this is for a contest, I want to submit my very best work. I decided to do the binding by hand. I watched a couple of video tutorials and got started. It took awhile to get into a rhythm, but I can see why some people find it relaxing. Realistically though, I think I will stick to machine binding because by the time I get to the binding, I'm itching to start my next quilt! Tomorrow my mini will go in the mail and I will cross my fingers. The top 32 minis will be displayed at the Houston Quilt Festival in a few weeks, and the top 3 will win a Cricut makers. I figure I'm a winner for trying new, scary things and entering my first contest! Well...shoot. I didn't win. But the winners are well deserved. It was a fun first experience and I will look forward to my next contest. I will keep my fingers crossed for you Jen. It looks great! Thanks for sharing it with Oh Scrap! Looks like you did a great job! I love the photo of you hand stitching! Good Luck on your entry! And thanks for linking to Design Wall Monday. I always like to see what you are doing. Good luck on your entry, and good for you for reaching out and trying something new! It would be so fun to have a quilt on display in Houston. I'm keeping my fingers crossed for you! That's great - your quilting looks really good and as you say (I only use a domestic as well) beginning the spiral is tricky. I was also taught to hand stitch the binding down, but have also tried machine. It can be relaxing by hand, but far faster by machine. Your points look amazing - all the best in the competition. Good luck! The center with all those points can get very bulky, but you managed it well! Beautiful job on the overall design and quilting! Your mini is fantastic! I entered one too and will share it on my blog next week. Fingers crossed we both win!! Wouldn't that be great?! Good luck! 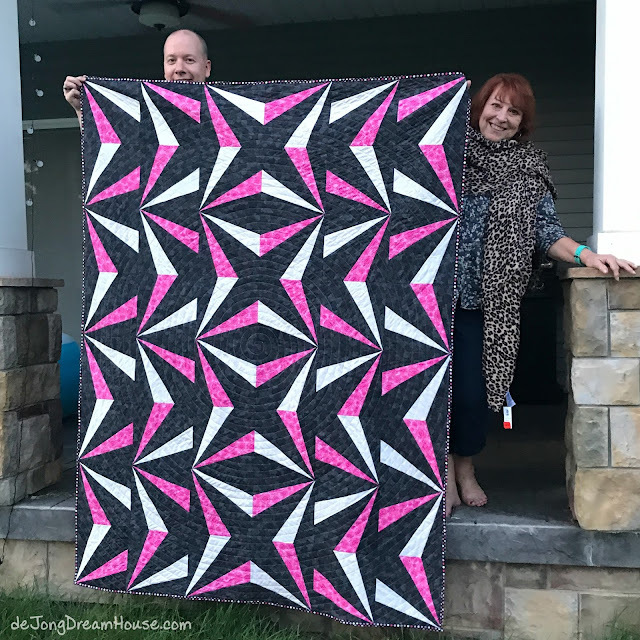 The quilting is a perfect match for this - well done! The spiral quilting is perfect! Thanks for linking to Finished or Not Friday. Love your mini and the spiral quilting! Lovely mini and kudos for trying something new! I'm sending lots of hope your way for a win. Thanks for linking up to Wednesday Wait Loss. Really interesting design, beautiful quilting! Good luck for the contest: I look forward to see all your future creations! !